Discover the potential of thermoplastic composites! Again the EATC and the AVK organize a seminar especially on thermoplastic composites. It will take place at Byk Chemie GmbH in Wesel. The event starts on May the 27th at 12.00 h and ends at the 28th at about 13.00h. Our seminar brings together a unique collection of topics and speakers and provides a practically-oriented, in-depth overview of applications using thermoplastic – in particular long fibre reinforced – composites. For the sixth consecutive year, the European glass fibre reinforced plastic (GRP) market grew in the European countries surveyed in this report. Compared to 2017, the European GRP market is expected to grow again by around 2 % to an estimated total of 1.141 million tonnes. Despite the advances, strong growth, and many innovations in other segments of the fibre reinforced plastics/composites market, GRP still remains the dominant material in the composites market with a market share of over 95 %. As in previous years, the generally positive trend in the European GRP market is more complex than it first appears with very strong regional and applicationor process-specific differences. In 2018, the market for GMT and LFT continues to grow at an above-average rate of 4.8 % having already grown at 3.6 % in 2017. From a long-term perspective, this market segment has almost quadrupled since 1999 – reaching a volume of 152,000 tonnes in 2018. During that period, its share of the total market has risen from 5 % to over 13 %. LFTs are the largest category of thermoplastic materials. Actual press article published by ARKEMA Innovative Chemistry and IVW (Institut für Verbundwerkstoffe) about “Thermoformable Acrylic Resin Systems for Large-Scale Production”. Find here the the full article. New Seminar – Discover the potential of thermoplastic composites! With more than 20 member companies the EATC bundles an enourmous amount of knowledge concerning thermoplastic composite systems. Together with the AVK several experts from EATC have renewed the former EATC-seminar which shows applications, trends, possibilities and advantages of this special composites group. At the 21st of April, 2016 the seminar took place the first time at BYK-Chemie in Wesel. More than 25 participants and experts made this first event a complete success. We are looking forward for the next seminar and want to thank all supporters! A new thermoplastic resin developed by the EATC-Member Arkema (Elium®) makes it possible to mould large parts with thermoset-like processes. Its low viscosity at 20°C allows fast and complete infusion without heating. The article describes how The CANOE technical platform recently produced the largest thermoplastic composite boat ever manufactured by vacuum-assisted resin infusion at room temperature – The complete hull infusion took 35 minutes for 45 kg of resin. 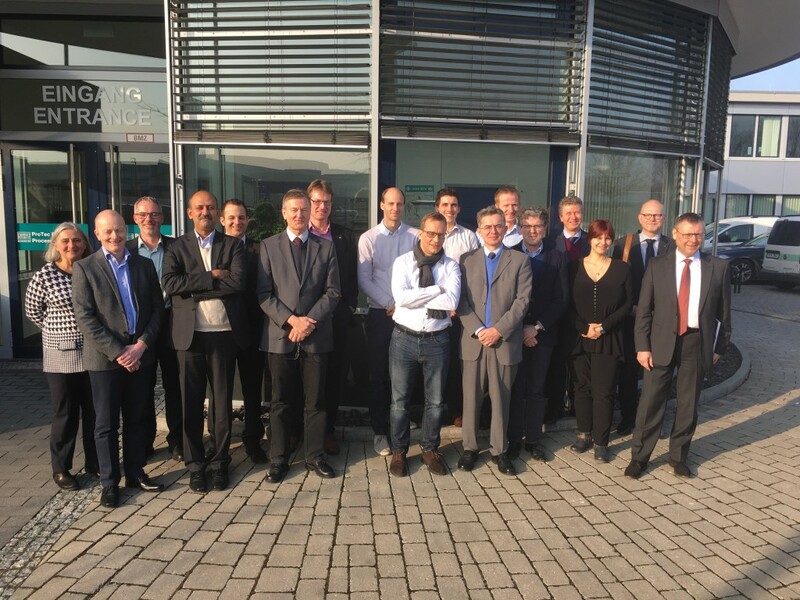 After visiting the Johns Manville plant in February 2014, the EATC group was now invited to visit the ProTec Polymer Processing GmbH in Bensheim (Germany) for their first meeting in 2016. On Tuesday the 19th of January 2016 several members of the EATC took the chance not only to discuss technical issues in a regular meeting, but also to visit ProTecs facility and getting an impression of their daily business. Special thanks go to ProTec for their kindness and hospitality!